A rich and earthy classic! Grandpa’s favorite and still a classic! Mild Dutch cheese with delicately pungent and earthy cumin seeds. 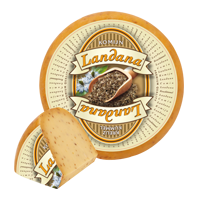 Landana CUMIN is delicious as a snack and very tasty on bread.